These regulations address the problems associated with manual handling and sets out best practice in dealing with them. The advice is intended for managers of small firms or similar organisations. But the general principles are relevant to all workplaces, whatever their size. Avoiding injuries from manual handling makes sound business sense. The Manual Handling Operations Regulations 1992, as amended in 2002 (‘the Regulations’) apply to a wide range of manual handling activities, including lifting, lowering, pushing, pulling or carrying. The load may be either inanimate - such as a box or a trolley, or animate - a person or an animal. This guidance gives useful practical advice for employers, managers, safety representatives and individual employees on how to reduce the risk of injury from manual handling. Musculoskeletal disorders account for almost half of all work-related ill-health and manual handling injuries represent over a third of accidents reported annually. More than a third of all over-three-day injuries reported each year to HSE and local authorities are caused by manual handling - the transporting or supporting of loads by hand or by bodily force. 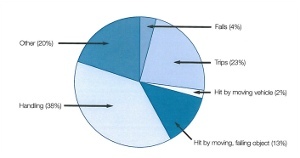 The pie chart shows the pattern for over-three-day injuries reported in 2001/02. Figure 1 Kinds of accident causing over-three-day injury, 2001/02 The most recent survey of self-reported work-related illness estimated that in 2001/02, 1.1 million people in Great Britain suffered from musculoskeletal disorders (MSDs) caused or made worse by their current or past work. An estimated 12.3 million working days were lost due to these work-related MSDs. On average each sufferer took about 20 days off in that 12-month period. Does a large work piece really need to be moved, or can the activity (e.g. wrapping or machining) safely be done where the item already is? An electric or hand-powered hoist. A lift truck. But beware of new hazards from automation or mechanisation. But beware of new hazards from automation or mechanisation. A lack of mechanical aids. 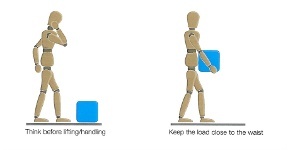 Manual handling risk factors and how injuries can occur. 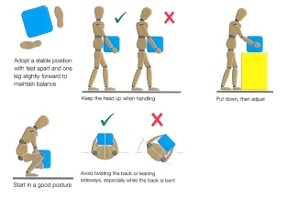 How to carry out safe manual handling including good handling technique (see ‘Good handling technique for lifting’ and ‘Good handling technique for pushing and pulling’). Appropriate systems of work for the individual’s tasks and environment. Here are some practical points to remember when loads are pushed or pulled. Handling devices. Aids such as barrows and trolleys should have handle heights that are between the shoulder and waist. Devices should be well maintained with wheels that run smoothly (the law requires that equipment is maintained). When purchasing new trolleys etc, ensure they are of good quality with large diameter wheels made of suitable material and with castors, bearings etc which will last with minimum maintenance. Consultation with your employees and safety representatives will help, as they know what works and what doesn’t. Force. As a rough guide the amount of force that needs to be applied to move a load over a flat, level surface using a well-maintained handling aid is at least 2% of the load weight. For example, if the load weight is 400 kg, then the force needed to move the load is 8 kg. The force needed will be larger, perhaps a lot larger, if conditions are not perfect (e.g. wheels not in the right position or a device that is poorly maintained). The operator should try to push rather than pull when moving a load, provided they can see over it and control steering and stopping. Slopes. Employees should enlist help from another worker whenever necessary if they have to negotiate a slope or ramp, as pushing and pulling forces can be very high. For example, if a load of 400 kg is moved up a slope of 1 in 12 (about 5o), the required force is over 30 kg even in ideal conditions good wheels and a smooth slope. This is above the guideline weight for men and well above the guideline weight for women. Uneven surfaces. Moving an object over soft or uneven surfaces requires higher forces. On an uneven surface, the force needed to start the load moving could increase to 10% of the load weight, although this might be offset to some extent by using larger wheels. Soft ground may be even worse. Stance and pace. To make it easier to push or pull, employees should keep their feet well away from the load and go no faster than walking speed. This will stop them becoming too tired too quickly. Observe the work activity you are assessing and compare it to the diagram. First, decide which box or boxes the lifter’s hands pass through when moving the load. Then, assess the maximum weight being handled. If it is less than the figure given in the box, the operation is within the guidelines. If the lifter’s hands enter more than one box during the operation, use the smallest weight. Use an in-between weight if the hands are close to a boundary between boxes. The guideline weights assume that the load is readily grasped with both hands and that the operation takes place in reasonable working conditions, with the lifter in a stable body position.